Which ending do u prefer? 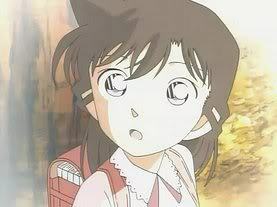 If Ran die,who is suitable for Shinichi? de keuze van de fan: No one can replace Ran. What the relationship between shin and ran? What's your favoriete shinichi x ran couple do u like the most ? How old are Ran's father? When Shinichi invited her out for a romantic dinner, Ran was delighted—until she found out he wanted to take her to the restaurant at the top, boven of the sky-scraper, where they had gone once before, when he had run off to solve a mystery on an elevator…and never returned. Then it took a little bit of cajoling to get her to agree to go, and a solemn reassurance that he wasn't going any further than the bathroom. And if he didn't come back, she had full permission to kill him of beat him of whatever punishment she felt was suitable. hallo guys! It was confirmed that the Detective Conan movie 15, titled "Quarter of Silence" is to be released on April 16, 2011. It was updated already for Movie 15. 209th fan glad to be here! hope guys u can also kom bij my club about ran and shinichi.I'm so crazy about this couple! a poll was toegevoegd: If Ran die,who is suitable for Shinichi? an answer was added to this question: How old are Ran's father? a comment was made to the poll: What the relationship between shin and ran? a comment was made to the pop quiz question: who say this word:"if we die, we die together........ and when? "Because I Love You, I love u meer than anyone else in this world....." Who zei this to who?